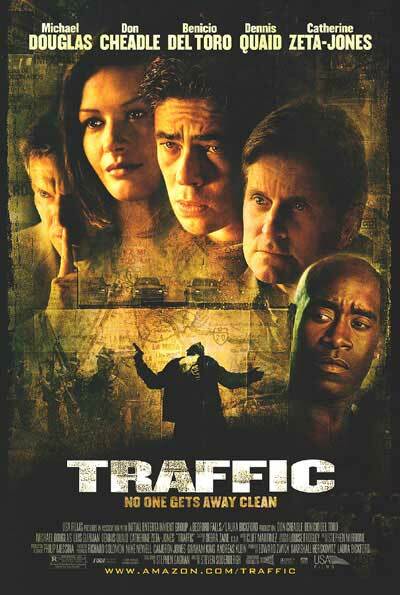 Tag line: "No One Gets Away Clean"
As you might expect from a motion picture that explores the “war on drugs” in such great detail, Steven Soderbergh’s Traffic is large in scope. In fact, the underlying message of the film is that the so-called war may be too large, perhaps even too politically-minded to achieve total victory. Fought on a federal level, it’s become a battle of governmental positioning and budgetary concerns, while the real fight rages on in the streets, where casualties are dying by the thousands. In Traffic, the world of illegal narcotics is turned inside-out, from the manner in which drugs are smuggled across borders right down to the courtrooms, where legal wranglings storm on in a vain attempt to bring foreign cartels to their knees. Judge Robert Wakefield (Michael Douglas) has just been appointed the President's new Drug Czar, but how can he combat dope on the streets of America when he can’t control his own daughter’s (Erika Christensen) addiction? DEA agents Montel Gordon (Don Cheadle) and Ray Castro (Luis Guzman) recently apprehended Eduardo Ruiz (Miguel Ferrer), a key member of an organization that smuggles drugs into the U.S. From Mexico. In exchange for immunity, Ruiz has agreed to testify against Carlos Ayala (Steven Bauer), the head of his organization. Once Ayala is taken into custody, his wife, Helena (Catherine Zeta-Jones), finds herself alone with their young son, and having to deal with the millions in debts her husband owes his “associates”. On the Mexican side of the border, the battle has become a crusade for a handful of honest lawmen such as Javier Rodriguez (Benicio Del-Toro) who are often stifled by the corruption within their own ranks. Shortly after making a successful bust, Rodriguez and his partner, Manolo (Jacob Vargas), are themselves apprehended by the troops of Gen. Arturo Salazar (Tomas Milian), a man who claims to be their comrade in the fight. Salazar says he admires Rodriguez, and wants to help him bring down the country's powerful cartels, but all is not as it seems. Soderburgh's unique approach to Traffic makes for a very interesting, not to mention incredibly emotional, picture. In creating the movie's look, Soderbergh used a variety of film stocks to give each segment its own distinct appearance. For example, the sequences set in Mexico are faded and yellow, bringing to them a raw edge that clearly illustrates how “down and dirty” the drug situation is there. When Judge Wakefield first meets with General Salazar, he asks the General how his country is dealing with the treatment of addicts after they've been identified. Quite casually, Salazar replies, “They O.D., they die, and then there’s one less user to worry about”. Clearly, there are fights the war on drugs is losing, while others are being ignored entirely. By the end of Traffic, we're left wondering if war is even the correct approach to the problem. With drug use hitting so close to home for so many people, the struggle against illegal narcotics is far from a battle for some. After all, as Judge Wakefield says at one point, how do you declare war on your own family?